By now, you’ve probably taken notice of our 2013 SLP Camaro, which was outfitted with an SLP TVS2300 supercharger, putting out a breathtaking 650 horsepower. 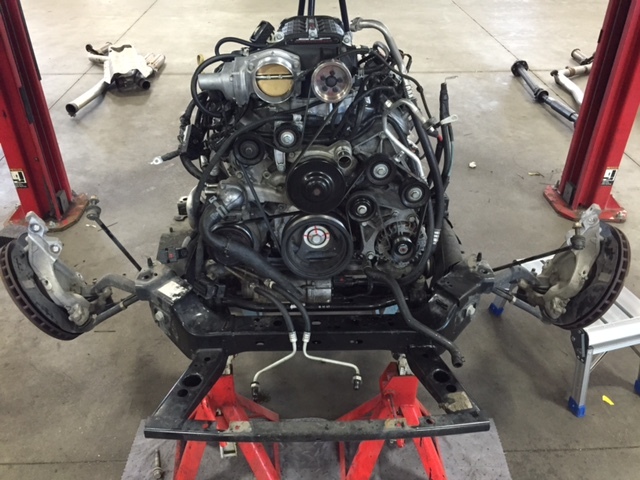 Well, the original LS3 has officially been removed and set aside to make room for a Chevrolet Performance LSX376-B15 crate engine. The 9.0:1 compression engine features all-forged internals, 6-bolt heads, and an LS7 camshaft, meaning we’ll be able to run more boost safely – up to 15 pounds, as per Chevrolet. 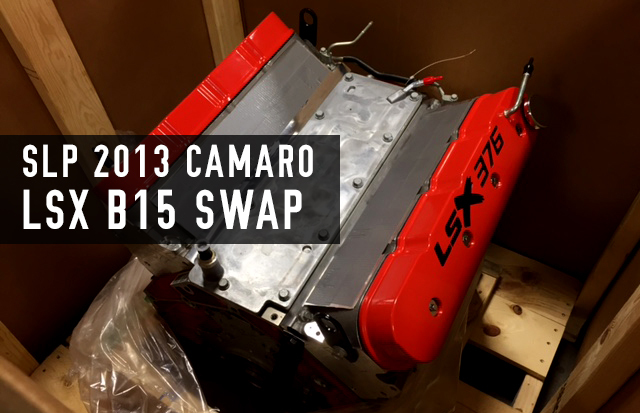 The very capable power plant will be matched to SLP’s supercharger to accomplish what our engineers call “a match made in heaven.” The idea is to see what our supercharger can do on an engine that can handle a load of boost, after simply running out of room with the stock LS3. The idea is to start at 9 pounds, and progressively use smaller pulleys to figure out exactly how much power we can squeeze out of the combination. Our supercharger package is designed to increase power and efficiency and has been designed and manufactured in-house at SLP. It features Eaton’s TVS technology rotating assembly with four-lobe rotors twisted at 160-degrees, and improved inlet and outlet ports that greatly enhance thermal efficiency, enabling greater volumetric capacity at higher rpm. Our engineers have ensured that this supercharger delivers lower intake temperatures during normal usage to avoid heat soak. In fact, the SLP 2300TVS supercharger runs 40-degrees cooler during normal driving conditions than competing superchargers. Fuel injector bosses are cast into the manifold providing optimum fuel delivery to the back of the valve for improved combustion and atomization of fuel. The intake manifold ports are port-matched to the cylinder head ports for greater airflow, and direct drive rotor pack eliminates the need for a jackshaft, extra bearings, extra pulley, and rear belt. This is the same technology and rotating assembly is used in the ZR1 Corvette, and each package is backed by our 3-year/36,000-mile supercharger limited warranty.